Recently the estate of Ann Hubbs gave us her family photographs and papers. Her grandfather was Episcopal priest Rev. John Hubbs and her uncle was Hobart & William Smith professor H. Newton Hubbs. Her father was Dr. Andrew D. Hubbs, known to family as Dunsmore and others as Andy. He was the first physician at the Colleges and the health center on St. Clair Street bears his name. As sometimes happens, this was a perfectly timed donation. I was preparing our new exhibit, A Changing World: Geneva and World War I. 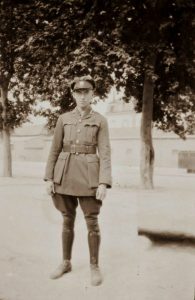 In 1917 Andrew Hubbs joined the American Ambulance Corps of the Red Cross and went to France after graduating from Hobart. The donation included a number of photos and a daily journal of his experience. The United States entered World War I on April 6, 1917. Soon after, Andrew joined the Ambulance Corps with several friends from Hobart including Genevan Alfred Nester. They set sail from New York on May 5. The first month of the journal reads like a young man on the grand tour of Europe. Andrew retired early, rose late, loafed around, and played bridge with his friends. There was the occasional reminder that he was going to a war. On May 11 the ship entered the war zone and the men slept dressed in bed in case the ship was torpedoed. No matches could be lit on deck to give away the ship’s position to German submarines. June and July were spent on drills, training, and waiting around for vehicles and an assignment. 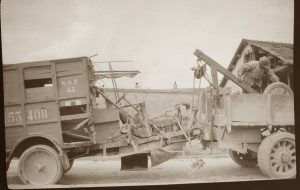 While they waited the corpsmen helped the French any way they could: repairing roads, doing farm work, and replacing the manpower that was at the front fighting the war. On August 10 Andrew’s unit reached the front near Verdun. As they put up their tents, “three shells whistled thru air and struck about 300 yds. away, everyone fell flat….All boys more or less scared.” German artillery regularly shelled the towns and roads around the camp. Andrew witnessed many “Boche aeros” (German airplanes) bombing the area or spraying the ground with machine gun fire. At such times the men ran into abris, or reinforced shelters, until the action ceased. 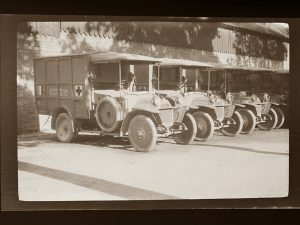 The Red Cross ambulance corps was replaced by the US Army Ambulance Service. Andrew’s unit returned to Paris October 13 and he and his friends sailed home from Liverpool, England on October 20. Some of Andrew’s friends joined the military and returned to the war. He entered medical school at Syracuse University as he had planned before war was declared. Dr. Hubbs practiced medicine in Geneva until his death in 1957. A Changing World: Geneva and World War I will be on display through April 2018.